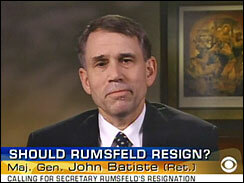 Last night, retired Army Maj. Gen. John Batiste appeared on MSNBC's "Countdown With Keith Olbermann." Batiste has been a CBS News consultant, but last night it was disclosed that he has been asked to leave that position due to his participation in an ad criticizing President Bush. Says Batiste in the ad: "Mr. President, you have placed our nation in peril." You can watch the "Countdown" segment here. CBS News Vice President, Standards and Special Projects Linda Mason confirmed to me that Batiste was asked to vacate his position. "When we hire someone as a consultant, we want them to share their expertise with our viewers," she said. "By putting himself front and center in an anti-Bush ad, the viewer might have the feeling everything he says is anti-Bush. And that doesn't seem like an analytical approach to the issues we want to discuss." She said that Batiste's appearance in the ad marked a violation of CBS News standards, in which "we ask that people not be involved in advocacy." Added Mason: "We might still go to the general to ask about things, but not as a consultant to CBS News." UPDATE: Mason contacted me this afternoon to expand on her comments. "General Batiste took part in a commercial that's being shown on television to raise money for veterans against the war," she said. "It isn't just that he took an advocacy position." She also said that the decision would have been the same had Batiste appeared in a similar ad in support of the president.